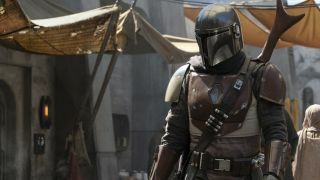 Some fresh names have been added to the cast and crew roster of the upcoming live-action Star Wars TV series, The Mandalorian. And it's starting to sound like one hell of a crazy show. We already know that Pedro Pascal (Narcos) will be taking the lead role as a lone Boba Fett-like Mandalorian gunfighter on the edge of the galaxy, and that the series will be executive produced by long-time Disney collaborator Jon Favreau. But you can now, incredibly, add to that list Carl Weathers of Predator and Rocky fame, and the legendary director Werner Herzog (Cave of Forgotten Dreams, Grizzly Man) in what appears to be an onscreen, in-front-of-the-camera acting role. “We’re having a great time working with this incredibly talented group and excited for everyone to see what we’re up to,” said Favreau in a post on the Star Wars blog. And it doesn't stop there. They're set to be joined by joined by Gina Carano (Deadpool), Giancarlo Esposito (Breaking Bad), Emily Swallow (Supernatural), Omid Abtahi (American Gods), and Nick Nolte (Affliction). That's before taking into consideration the rolling list of directors, which is set to include Dave Filoni (Star Wars: The Clone Wars, Star Wars Rebels) Deborah Chow (Jessica Jones), Rick Famuyiwa (Dope), Bryce Dallas Howard (Solemates), and Taika Waititi (Thor: Ragnarok). The series, set to launch in late 2019, will be the headline attraction of the upcoming Disney+ streaming service, which will be taking on Amazon Prime Video and Netflix for pole position in the battle for control over your TV viewing time.